An outburst on Comet 67P that the Rosetta spacecraft captured on July 10, 2015, was caused by the shifting, collapsing surface, according to new research. The image shows 15.81 meters (51.87 feet) per pixel. A cliff's collapse likely caused a bright outburst of gas and dust on Comet 67P/Churyumov-Gerasimenko in 2015, scientists announced today (March 21). The observations, captured by the European Space Agency's Rosetta spacecraft, mark the first time that researchers have drawn a direct link between changes in a comet's features and outbursts on that same comet. Two studies investigating changes to the comet's surface as it approached the sun were released today in conjunction with a presentation at the Lunar and Planetary Science Conference in The Woodlands, Texas. On July 10, 2015, Rosetta observed an outburst in the Seth region of the comet, according to the study. The frequency of this type of high-speed emission of gas and dust increases as the comet approaches the sun. Five days later, new images of Aswan showed enormous change. The fracture was no longer visible; a new, bright edge had replaced it. There also were several meter-size boulders at the bottom of the cliff, according to the study. "The last time we saw the fracture intact was on 4 July, and in the absence of any other outburst events recorded in the following 10-day period, this is the most compelling evidence that we have that the observed outburst was directly linked to the collapse of the cliff," study leader Maurizio Pajola, a researcher at the University of Padua in Italy, said in a statement from the European Space Agency. The collapse took place during the night, so an extreme temperature change (such as one that might occur when a comet passes through sunlight) couldn't have caused it, the scientists reasoned. Instead, earlier work on the Rosetta mission suggested that the collapse was triggered by seasonal changes that caused thermal stresses in the cliffside. This would have fractured and exposed volatile materials such as water-ice — prime material to vaporize and lead to a greater collapse, the scientists said. "If the fractures permeated volatile-rich layers, heat could have been transferred to these deeper layers, causing a loss of deeper ice," Pajola said. "The gas released by the vaporizing material could further widen the fractures, leading to a cumulative effect that eventually led to the cliff collapse." The scientists estimated that about 11,000 tons (10,000 metric tons) of cliff material was removed in the collapse, including about 110 tons (100 metric tons) that was lost directly to space. The size of the debris boulders, which ranged from about 10 to 33 feet (3 to 10 m) across, matched distributions seen at the bottom of other cliffs on the comet, according to the study. Views of Comet 67P's Aswan cliff collapsing. Arrows show the fracture, exposed water ice and the new cliff top. The new, exposed face also allowed scientists to see what happened when pristine water ice was exposed to space for several months. At first look, the cliff face was six times brighter than the average surface brightness of the comet nucleus because of the newly uncovered ice, the researchers said. But only six months later, by Dec. 26, 2015, the cliff face was only three times brighter than the average. This finding suggests that much of the water ice vaporized in that short period, the scientists said. The cliff face continued to fade, matching the average brightness of the overall nucleus by Aug. 6, 2016. 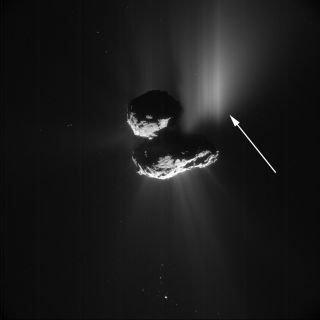 The cracking and heating of Comet 67P eventually led to the sublimation (transition from solid to gas) of buried ice, leading to more cracks and, eventually, a cliff's collapse. The collapse, and release of gas and dust, led to a bright outburst. Comet 67P's Aswan cliff before and after the collapse; (c) shows the detached overhang's dimensions. A related study released today in the journal Science examined changes on Comet 67P more generally. One location the researchers investigated had steep slopes that retreated as fast as 18 feet (5.4 m) per day as the comet approached its closest point in its orbit around the sun, also known as perihelion. The Science study's team, led by Mohamed Ramy El-Maarry, a visiting scientist at Colorado's Laboratory for Atmospheric and Space Physics, saw cliff collapses in two areas. In another zone, they noted "ripple-like features" reaching a diameter of roughly 100 m (330 feet) in just three months, before the features faded and were replaced by a fresh set of ripples. "The authors note that most changes — including erosion and the movement of boulders — occurred around perihelion, suggesting that they were driven by shifting patterns of exposure to sunlight," the American Association for the Advancement of Science (AAAS) said in a statement. "Some changes, such as the fracturing of 67P's neck, are related to the comet's spin rate, the authors say," the AAAS statement continues. "Combining all of these features is helping them to determine how quickly Comet 67P's surface is changing, indicating that its major landforms have been in place for numerous orbits, probably longer than it has been on its current orbital pattern."